Being out in the desert is much like being on a boat at sea, preparation and self-sufficiency is key to survival. In both cases you need to take with you everything you require – plenty of water, food, safety gear, plan the route in advance and wear the right clothing. It might sound a bit dramatic for a drive of less than 20 km but this week we had another reminder of how safety and recovery gear are as important as life jackets and dan buoys. 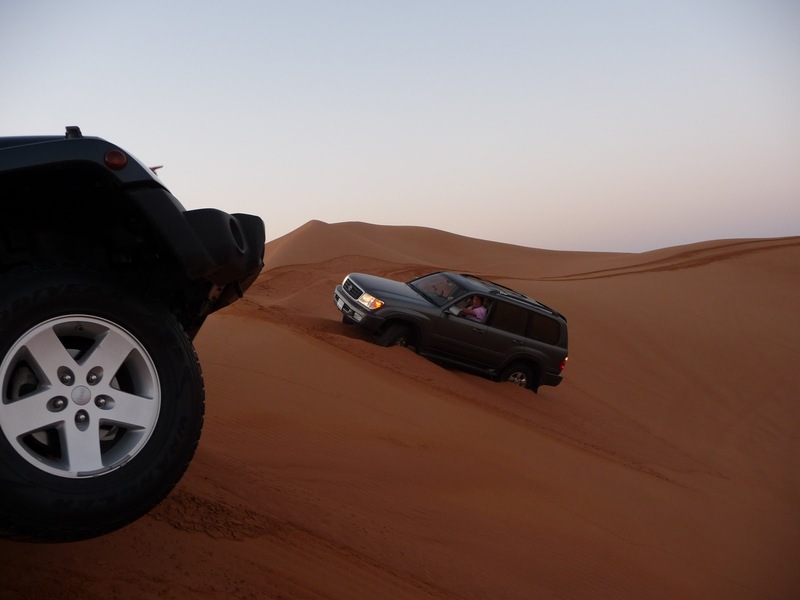 Desert drives are not done alone, it’s good practise to have at least one other vehicle with you if you are heading into the dunes. When (and not if) one gets stuck or breaks down then the other can recover you. During a recent trip not one but two cars popped tyres off during the course of the morning but thanks to plenty of experience a team effort ensured these were soon fixed without even resorting to changing the wheel in either case. 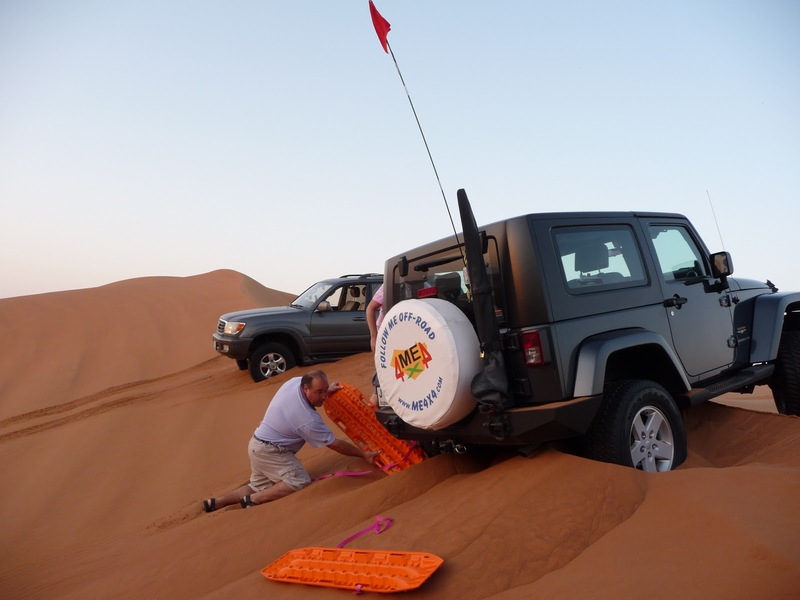 With the car jacked up to raise the offending wheel off the ground (some digging was also required) the tyre was rinsed in water to remove as much sand from the inside as possible, then reinflated until it was firmly in place on the rim before deflating back to the lower pressure used in the sand. After a quick assessment out came JJs bright orange sand ladders and, using them as shovels, Kevin & Martin started digging away behind the rear tyres. I joined in with my arms sweeping away the sand from the nearside wheel. 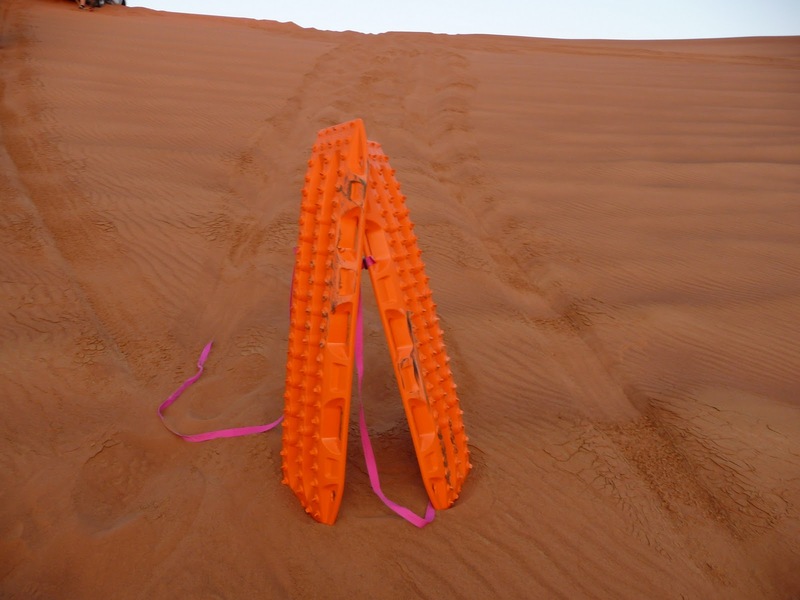 Sand ladders are simply moulded plastic boards with lots of studs on them like a crocodile’s back. 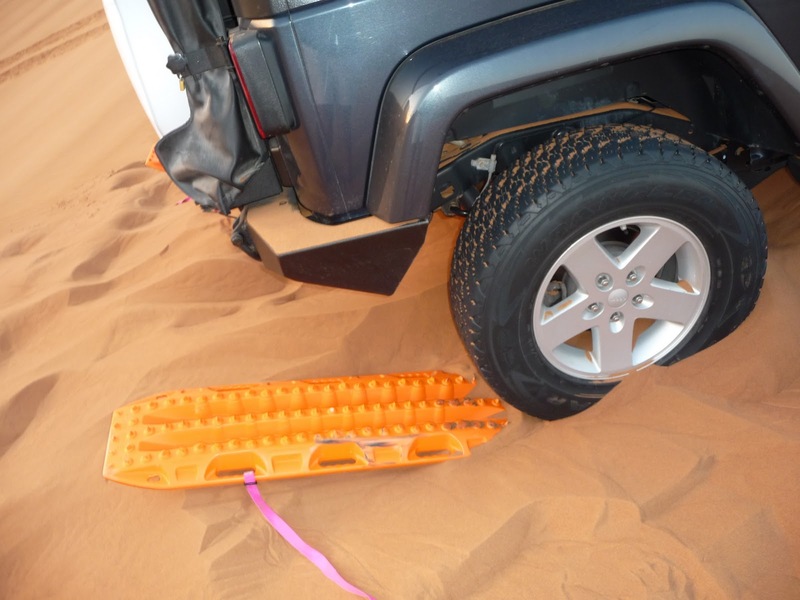 Once enough sand had been cleared a ladder could be jammed under each wheel with the retrieval straps (bright pink so we can find them again) spread out away from the vehicle. 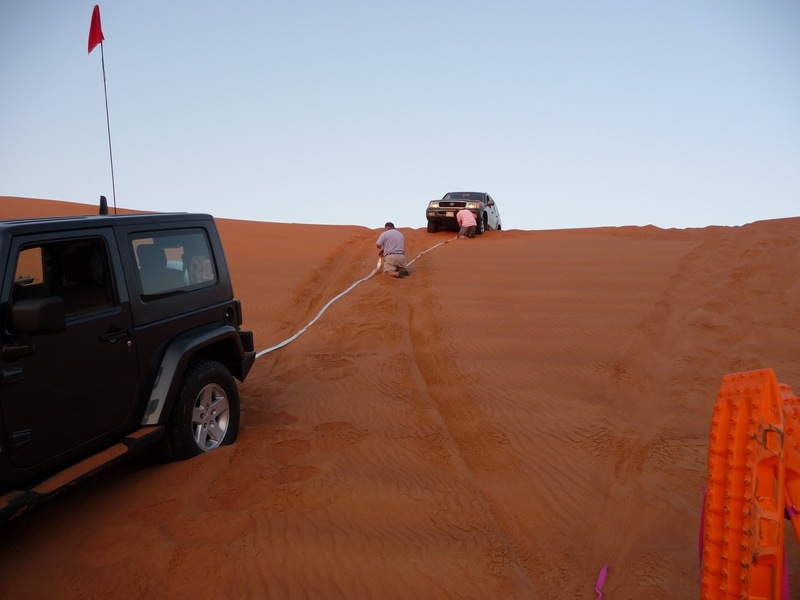 Kevin got back into the driving seat, put the gears into reverse and within seconds JJ had clambered over the solid ladders back onto drivable sand. I heaved the now buried ladders out of the sand by their straps and stuck them upright nearby so we didn’t forget them. Attention now turned to Martin’s vehicle. Kevin reversed JJ in front of the stranded 4×4 positioning her about half way up the slope. A couple of towing straps were joined using a soft shackle made of kevlar rope. The shackle is extremely strong but at the same time soft enough not to damage the loops in the towing straps. 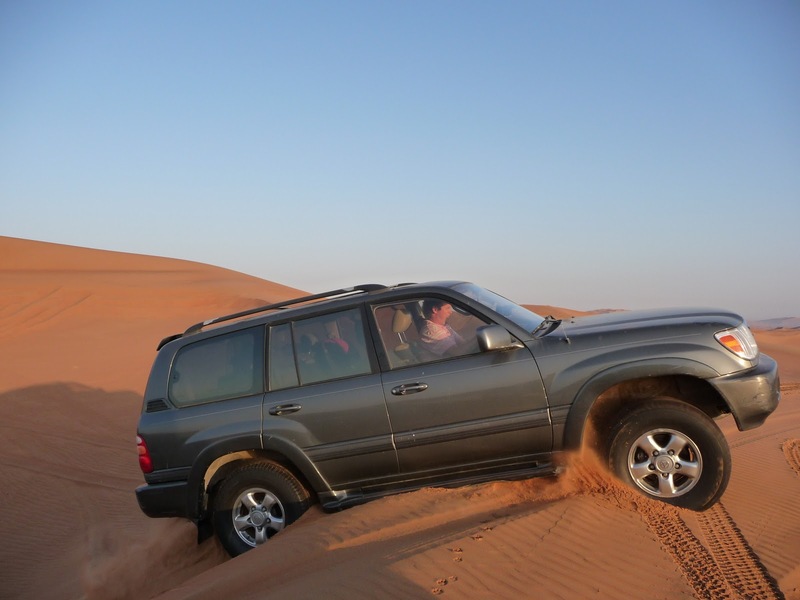 Then it was simply a matter of JJ heaving the Toyota Landcruiser sufficiently further forward for gravity to take effect. 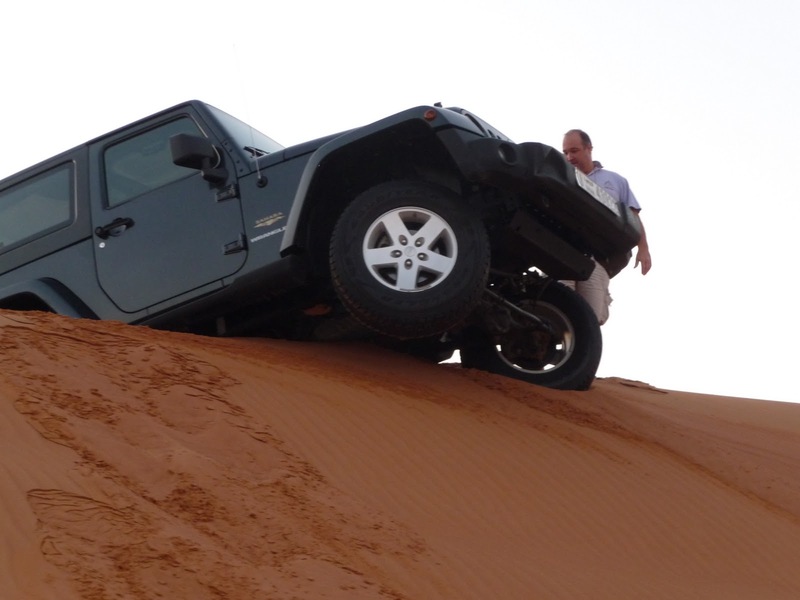 The front wheels fell forward, the back lifted out of the sand and the 4×4 slithered down the sand face effortlessly.